That is such a great point Julie!! It is a huge responsibility for them. I feel like it would make the child have to grow up more quickly one they pick up on that. They would feel the need to always be there for the child. And when they are grown it makes it more difficult for them to go experience their own happiness because they are TOO tied to being sure the parent is OK. It can be psychologically damaging. And perhaps we are kindreds. I would love to get out to poetry events but I don’t do enough research about what is available near us. Thank you again for stopping by. I guess I’m a weirdo. I love my kids and think that they’re wonderful, fascinating people, but I don’t usually think of them as being high on my inspiration list. Often my kids do things that inspire me and I hope vice-versa. I think I tend to look for inspiration from more abstract sources. Thanks for the interesting thing to think about! I think you’re absolutely correct that we need to know what inspires us and remember those sources often. I love that, “When the student is ready, the teacher approaches.” Just perfect. I love the examples that you gave. Thank you so much!! You know, I’ve never considered my kids an inspiration, I look at them more as my motivation. Everything I do, I do for them. 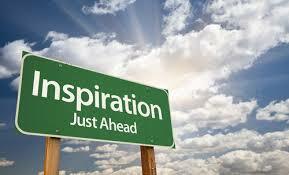 Inspiration for me, comes from people who are where I want to be, such as successful business owners, or others. Inspiration also comes from within and I find myself inspiring myself all the time. I’m always trying to do better than I had previously. That sounds weird, but hopefully you know what I mean. Misty, That doesn’t sound weird at all. I inspire myself by improving as well. I think that is one of the most important ways. Being our own hero is an amazing feeling, and not conceited. I too am inspired who people are further along than me. I think too many people see what others do and decide they can’t do it. They don’t realize there are steps to be taken before they reach where that person is and they just aren’t there yet. OH, SEE? You and I just inspired a future post. I love when that happens!! Thank you as always for stopping by. I completely agree that we need multiple sources of inspiration and that if we can be one of them for ourselves, that is even better! I try to be inspired by my spirituality: spirit guides, dreams, intuitive readings, etc. They all can be SO encouraging & inspiring for me. My reading inspired me as well. I need to learn how to tune into my spirit guides. I have been told I have one that appears to me. I’ve seen it. I appreciate you sharing that. Thank you for visiting me here. I LOVE your site! Wow, thanks so much!! Glad my site resonates with you. How cool that you have seen one of your spirit guides! I only see mine as flashes out of the corner of my eye unless I am doing pathworkings or meditations. Usually, they show up there. You are so welcome. There is so much more that I want to learn.